People in Japan pay good money to eat the deadly pufferfish. There, the food is called fugu. The fish can cost more than $100 a kilogram. Eating fugu is especially popular now, during the winter holiday season. But in the last few years, the fugu market has seen a change. The part of the ocean where pufferfish live is warming quickly. In answer, pufferfish are traveling north to find cooler water. Along the way, new kinds of poisonous fish are being created. These pufferfish hybrids worry government officials. They are afraid people will accidentally eat them and die. 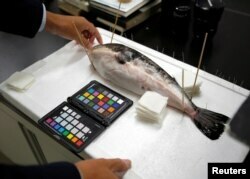 The Japanese government has ordered fishermen and fish traders to throw away any hybrids that they catch. Some industry workers strongly object to the order. They note that hybrids have poison in the same areas as regular pufferfish. Trained cooks and fish butchers know how to remove the areas that contain the poison. Usually the poison is in the fish’s liver and reproductive organs, or sometimes the skin or muscle. The Japanese take pufferfish danger seriously. A supermarket in western Japan once accidentally sold some pufferfish that had not had their poisonous livers removed. The town used its missile alert system to warn residents. A high-end fish seller adds that the fish tastes good. But the seller, Koichi Kushida, notes that pufferfish hybrids are a concern. As more hybrids appear in the market, Kushida checks all the fish himself. But in truth, even experienced fish handlers and scientists cannot always identify the hybrids. The one certainty is that the hybrid population is increasing. And this rise of mixed pufferfish is another example of the effects climate change is having on sea creatures. The Reuters News Service reported this story. Kelly Jean Kelly adapted it for Learning English. Ashley Thompson was the editor. hysteria - n. a situation in which many people behave or react in an extreme or uncontrolled way because of fear, anger, etc.